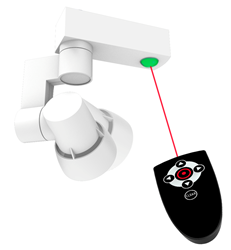 A motorized track fixture that can be adjusted from below with a simple handheld controller. No more ladders! Soon, we will be wondering why we were ever getting up on ladders. Loto Lighting today announced the availability of the smallest motorized light fixture ever created for the display, gallery, and hospitality industry. The Tessa can be adjusted without a ladder by using a simple remote control, so it is perfect for small shops and galleries or tight window displays, providing increased safety and convenience at a reasonable price. Motorized lighting is an idea that has never been fully developed where it is needed most. Long reserved for entertainment or high-end functions, it is now available in more familiar fixtures used in display, thanks to a set of custom built motors, and a patented control method using a laser to select each lamp, then radio to drive the motors. The control scheme allows for one remote to control any number of fixtures. Smart phones and special apps are not needed, and there is no additional equipment or setup. Fixtures can be installed in traditional fashion. The Coach flagship store in New York City uses Loto driven fixtures in its 20-foot tall atrium, allowing for seasonal display adjustment without bringing in a mechanical lift. 2016 will mark the year when the company raises the expectations and standards of customers in the retail, gallery, and hospitality market. Loto Lighting is building an entire line of motorized fixtures for a wide range of lighting needs. There will be high output track fixtures using COB components, a range of recessed fixtures using a unique motorized gimbal, and pendant systems. These new fixtures will also have individual dimming control. 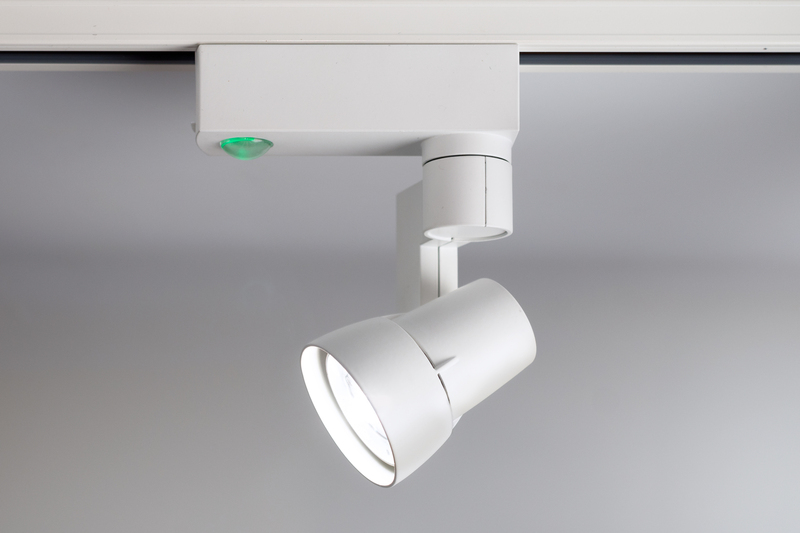 The Tessa is compatible with most popular track systems, and uses an MR16 lamp with GU10 socket. Tessa will be paired with the popular SORAA lamp. Loto Lighting will be selling through national account lighting distributors and select online resellers. Founder Tom Devlin, an MIT engineer and art school graduate, built his first motorized light fixture in 1989 for his graduate thesis at the Royal College of Art in London using a computer controller. (James Dyson had graduated a few years earlier.) His lamp seemed to have an obvious benefit, but the technical hurdles were too difficult and expensive. He went on to become a successful consultant designer and inventor in Boston, creating new products for companies such as Gillette and Oral-B. But Tom wanted to finish what he started. When laser pointers became commonplace, he realized that he could do away with a computer completely, using the precise beam of light to select each lamp instead of requiring an address code. Years of development followed, with attempts at licensing to other lighting companies. Finally, he found a match made in heaven with Forma Lighting, a highly respected Milan based company that does not sell in USA. The companies divided worldwide territories, then set about sharing each others’ know-how in an unprecedented explosion of creativity, with Loto developing customized gear motors and controllers to suit Forma’s extensive portfolio of design. Tessa is a first glimpse of the large catalog resulting from this collaboration. Note to editors: Loto Lighting and Tessa are trademarks of Loto Lighting LLC. SORAA is a trademark Soraa Inc.